In search of inspiration I took a trip to the spectacular 71 hectares of wildflower meadow on the banks of our great river Thames, Chertsey Meads is gorgeous from May to July when the wild flowers are in bloom. I went at the end of June and the ripple of blue in the breeze was soul searching. The wildlife abundant and surprising. The Friends had, a few days before my trip, a call from Southwark Council asking when we were going to mow the meadow at Dog Kennel Hill. The meadow gets, I guess, straggled as the season progresses and the Council still has a cultural neatness on mind. I see abundance of butterflies, bees and food for the birds. 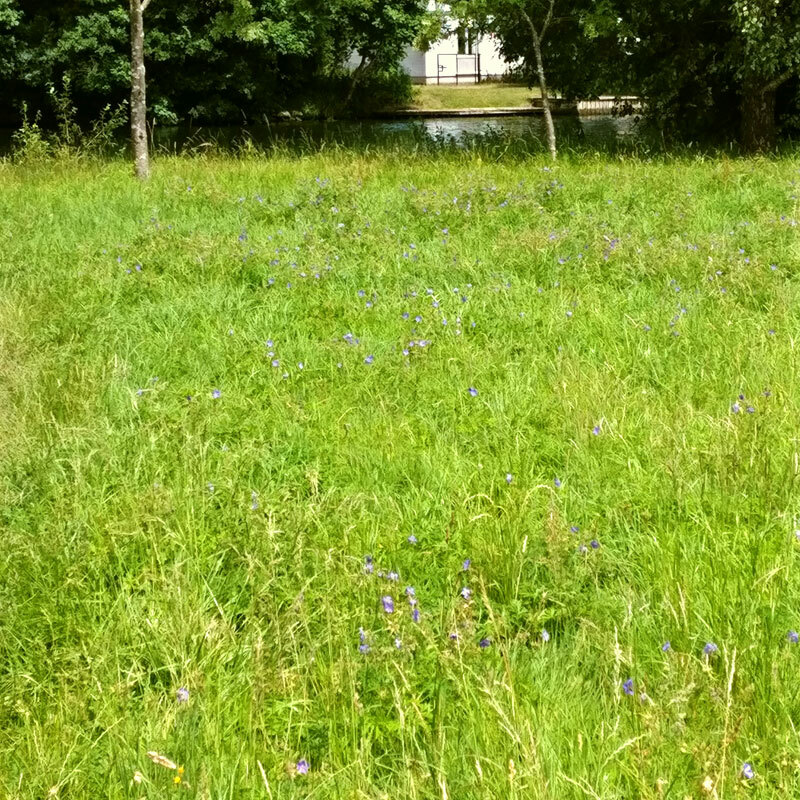 So, my trip to look at one of the great Council run meadows within the M25. 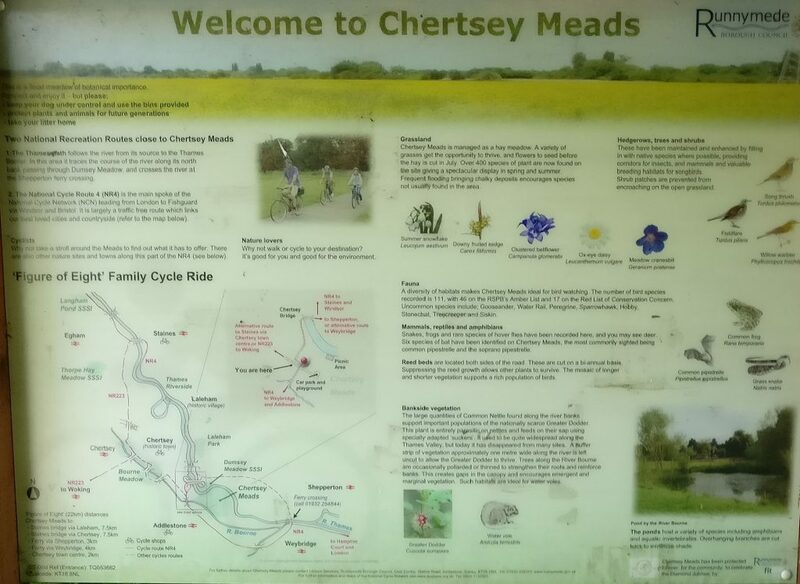 Chertsey Mead is mown towards the end of July. We scythe they mow. This year we are due to scythe at the beginning of August. A special workday is needed as the creeping thistle needs to be up rooted and controlled. In the pockets of open ground we will sow new seed for future diversity. A great success, this year, has been the significant growth of Yellow Rattle in the meadow. Several patches were evident. This attractive, hemi-parasitic, grassland annual can be difficult to get established. But, well worth the effort as research shows encouraging yellow rattle in hay meadows greatly increases biodiversity by restricting grass growth and thereby allowing other species to thrive.. This autumn we look to sow some more Yellow rattle. Galium verum was last year’s success and this herbaceous perennial has returned to scent the meadow this year. The yellow whorls of its frothy flowers are such a joy to see in July and August. Red Campion was evident but the Bladder Campion (Silene vulgaris) not. We still struggle with the pink family. For the first time a patch of Professor-weed (Galega officinalis) has occupied the meadow. It is well established on Green Dale so may have been spread by birds. It’s a hardy perennial that blooms with pretty lavender mini-sweet pea flowers. Most important is the wildlife dependent on our meadow. Take a look and you can see the teeming abundance sustained by just one special patch of wild meadow.